Probably one of my go-to dishes, due to the speed with which it can be prepared and how many different veggies can be added in, spaghetti is something I’ve really missed since switching to a paleo and autoimmune-supporting diet. No pasta + no tomatoes or peppers = sad Caitlin. But no more! 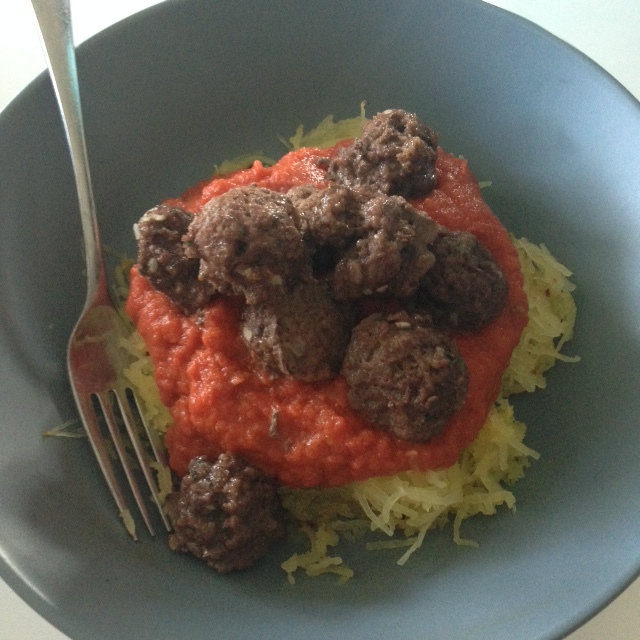 I’ve discovered (and mastered) this AIP nomato sauce from He Won’t Know It’s Paleo (seriously, check her recipes out – I lick the bowl with every single one) and I’ve also discovered the beauty of spaghetti squash and spiralized veggies, perfect vessels for this delicious sauce. But anyways, the recipe. Again, customize this to your heart (and family’s) content. Cooking is very forgiving and flexible. Mix everything well. Then, form into 1.5-inch (or so) balls (or use a cookie scoop like I did) and place onto a foil-lined baking sheet. Bake at 350F for about 20 minutes. Serve atop spaghetti squash ‘noodles’ (cut in half, bake cut side down for about an hour in a 400F oven) or zucchini ‘noodles’ (sauté in your favourite cooking fat with a bit of garlic until heated through). Top with nomato sauce and enough meatballs to satisfy your hungries. Meatballs should keep in the fridge for 3-4 days or frozen and eaten within a couple of months. Tip: If you have leftovers in the freezer you can also throw together a quick dinner if you don’t feel like cooking one night. Emergency protein FTW! Let me know if you make these meatballs and how you like them!